For overview information about discussions in a course, see Managing Course Discussions. Divided discussion topics are visible to all learners, but the posts, responses, and comments within these topics are divided so that learners participate in the discussion only with other members of the same group (either the same cohort or the same enrollment track). You can choose only one group type by which to divide discussions, even if your course uses cohorts and also has multiple enrollment tracks. For example, you have two enrollment tracks in your course (“Free” and “Certificate”). If you choose to divide discussions based on enrollment track groups, and specify that a course-wide discussion topic called “Assignments” is divided, then although all learners see the topic, learners in the “Free” track interact only with posts, responses, and comments from other learners in the “Free” track, and learners in the “Certificate” track interact only with posts, responses, and comments from learners in the “Certificate” track. If you divide discussions, a good practice is to also apply a naming convention so that learners clearly see the audience for the discussion topics before they add posts to that topic. For information about naming conventions, see Apply Naming Conventions to Discussion Topics. For more information about managing divided discussions, see Managing Divided Discussion Topics. As you develop your course, you add three new course-wide discussion topics, so that in addition to the default General topic, you have a total of four course-wide discussion topics. In courses where either cohorts or multiple enrollment tracks are enabled, you see options to divide discussion topics based on the available group types. By default, all course-wide discussion topics and content-specific discussion topics are unified: all learners can interact with all posts responses, and comments. You can change discussion topics of either type to be divided or unified on the instructor dashboard in the LMS. In courses that started prior to April 10, 2017, in courses with cohorts enabled and “cohorts” selected as the type of group by which discussions are divided, content-specific discussion topics are by default divided. 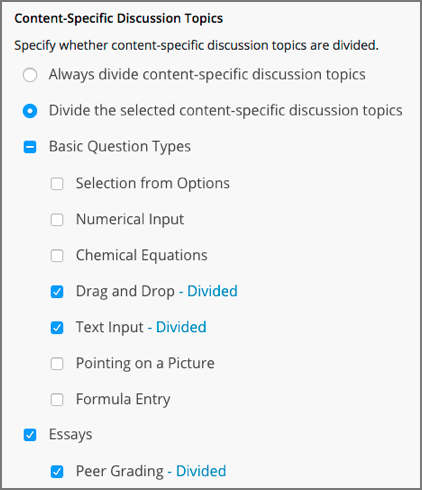 If you want all content-specific discussion topics that you add in your course to be always divided, follow the steps in the topic Specify that All Content-Specific Discussion Topics are Divided.